It’s Wednesday. Yes, I know you are fully aware of the days of the week. But it’s also mid- week. I promise no hump day jokes. I’m no good at that anyway. But internet cousins ( that’s totally cool I adopted you right?) we’re almost at the glory land of weekend fun..can you see it? Are you into it? You may be too busy doing what adults do to notice?..ok cool no biggie. In the mean time, I can provide you with a treat. I’m not into tricks. Just a l little something to shake up your mid- week style and provide you with wholesome goodness. We all need wholesome everything in our lives. Yes. Chia. Whoa! The craze on the chia was insane right? At that time when that commercial aired, I didn’t even know that the seeds were edible. I just wanted the “pet”. And somehow that sneaky seed has crept back into our lives. The seeds contain protein, fiber and a whole slew of other awesome benefits that does your body good. You know, wholesome everything, in that very tiny seed. Add sweetener to coconut milk and stir until dissolved. 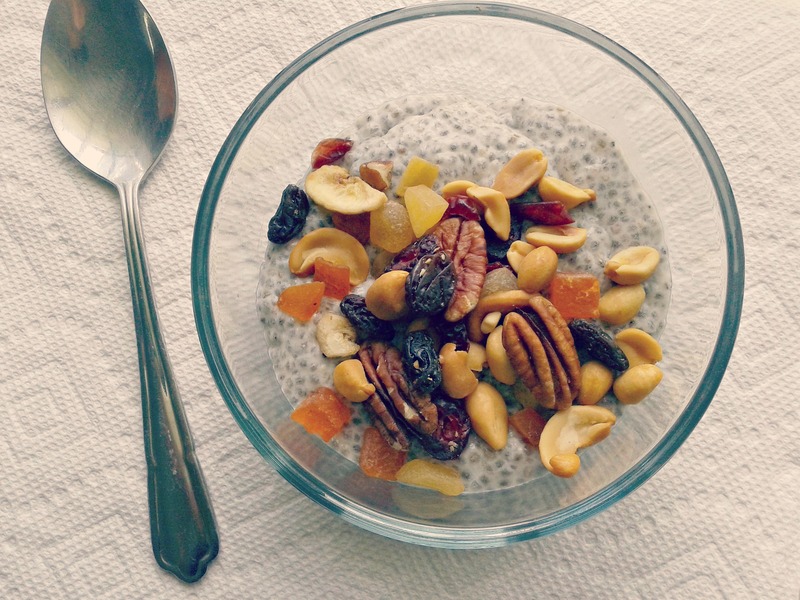 Whisk in chia seeds until all has been incorporated into coconut milk. Cover and leave jar/ glass to stand for 3 minutes. The chia seeds would have started to absorb the milk by this time and should start thickening. Whisk again to break up any clumps. The mixture should be thick by this point as the seeds would have doubled it size. Pour into a bowl if serving and top with add -ins for some texture. This can be stored in the refrigerator for 2 days. Note: You can add more coconut milk if you like. This is all personal preference. You’re in a rush. I know. I understand. Our lives have become a huge to – do – list and so very little time to get things done. Breakfast. We need it. We sometimes tend to forget it. Let’s stop doing that, ok ? Yes, I do too. Totally not judging. We all want to have something a little easier to grab and go in the morning. Coffee is a great idea, currants roll..not so much. How about we chuck some good ‘ole fiber in.Yes? 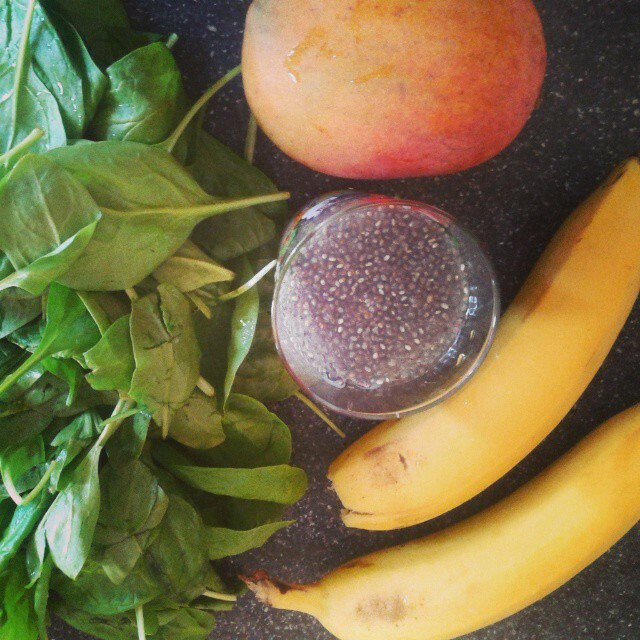 This smoothie can totally be dinner, lunch or a snack too.Your time is limited, it’s important. I understand. I got you! Awesome..let’s go. 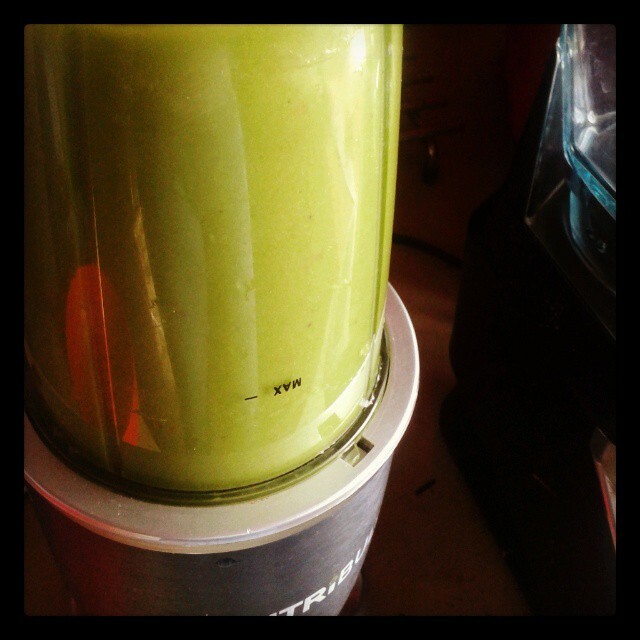 Add spinach and water into blender and blend.Next add in bananas and mango. When everything has combined smoothly add in chia seeds and blend for an additional minute.You can add more liquid if you desire, depending on the consistency you like. Makes 2 servings. Note : You can substitute the spinach for any favorite leafy vegetable such as kale/ romaine lettuce or watercress. You can also mix the greens when you want to switch it up!